Back in September, the state of California passed a law allowing anyone in the entertainment industry to force sites like IMDB to remove their age or birthday if they didn’t want the information posted. The idea was to protect actors who don’t want studios to know how old they are so they couldn’t be discriminated against because of their age, but the actual legality of the law was outrageously shaky—thanks to this whole “free speech” thing we have in America. At the time, one critic even pointed out that it shouldn’t be IMDB’s responsibility to protect people from discrimination in the first place, but that it should be the actual studios and executives that do the discriminating. Now, much to nobody’s surprise, it looks like a federal judge in San Francisco is getting ready to toss out the law on the grounds that it’s kind of silly and ridiculous. According to the New York Post, the judge told a lawyer arguing in defense of the law that he couldn’t remember a case “as challenging to defend” as this one, later suggesting that continuing to fight for it would only direct more taxpayer dollars to the lawyers working on behalf of IMDB. The lawyer suggested that the law wouldn’t infringe on anyone’s free speech because it only applied to specific websites, but the judge responded that an argument like that only pokes more holes in the law. 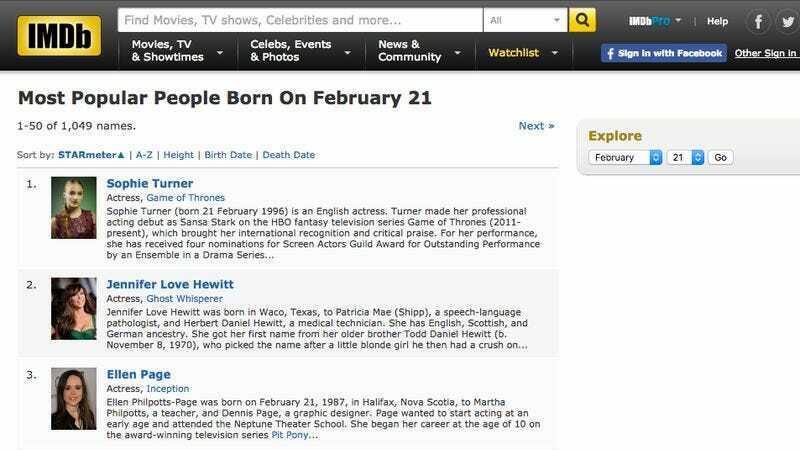 After all, stopping IMDB from posting ages or birthdays would do nothing to prevent anyone else from posting that information, which would negate any chance it would have of helping to stop age-based discrimination. So, it looks like the many beautiful people of Hollywood must once again submit to the horrors of aging—or at least the women of Hollywood will, since men can age all they want and still get roles.